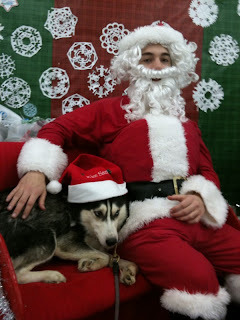 Lucy had her photo taken with Santa today. She was scared, but did it anyway. What a good sport she is! After the picture was taken, she didn't want to get out of the sleigh! I guess she figured out Santa isn't so bad. Just another pawesome adventure to add to her new and wonderful life! Tank woo fur seeing she gets it! Nice article you got here. It would be great to read something more concerning that topic. Thank you for posting this info. Great Post! Lucy looks like a good pup!